In the first event of the NCAA Championships, Stanford put forth the Olympic trio of Katie Ledecky, Simone Manuel and Lia Neal, as well as versatile sophomore Ella Eastin, in the 800-yard freestyle relay. While Cal countered with a deadly quartet of Kathleen Baker, Kristen Vredeveld, Amy Bilquist and Katie McLaughlin, the Bears lost by about 5.5 seconds despite their time being among the fastest in NCAA history. But little did Cal know that the first event was indicative of how the rest of the meet would go. As the Bears chased the Cardinal at the IU Natatorium from last Wednesday to Saturday, the No. 1 Stanford women’s swim team displayed its dominance at the NCAA Championship. No. 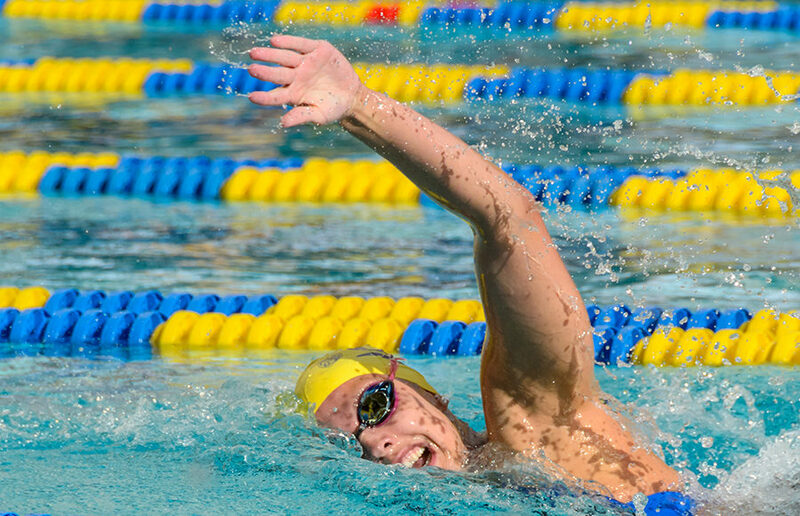 2 Cal women’s swim finished second with 366 points behind Stanford’s 526.5 and ahead of No. 9 Texas A&M’s 292.5. 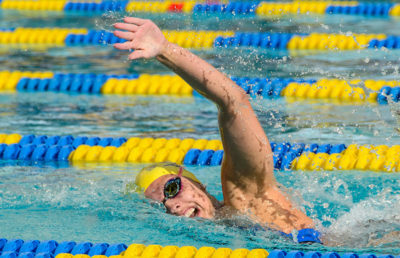 Stanford was the top seed and favorite in 10 of the 13 individual swimming events, as well as four of the five relays. The Cardinal partially lived up to expectations by claiming 10 national titles behind Manuel, Ledecky and Eastin, which led to their first national championship since 1998. Baker, this past week’s triple-event winner, was Stanford’s biggest thorn. On the second day, Baker outlasted Eastin in the 200-yard individual medley and almost took down Eastin’s NCAA and American record from last year in the process. Baker also blasted past Stanford juniors Ally Howe and Janet Hu in the 100- and 200-yard backstrokes, respectively. Baker’s incredible contribution on four relays earned her 2017 CSCAA Swimmer of the Year. Other than Baker, who won three events in total, Cal senior Farida Osman was the only national champion in an individual event. After touching last at the halfway mark, Osman scorched through the last 50 yards to win the 100-yard butterfly ahead of a star-filled pool. Osman, in her final collegiate competition, claimed her only individual national title and anchored the winning 200-yard freestyle and medley relay, which interrupted Stanford’s dominating performance throughout the championship. While Cal was performing well, the disqualification on the second day’s 400-yard medley relay shutout the Bears’ small glimmer of hope at a national title. The race started with Baker’s new championship and school record in the 100-yard backstroke. Although Cal didn’t have the fastest breaststroke or butterfly specialist in the field, freshman Abbey Weitzeil didn’t hold back as the anchor and left the starting blocks .1 seconds too early. The relay wouldn’t necessarily swing the point total in favor of the Bears, but it wiped away hopes Cal had at knocking off Stanford. Freshman Maddie Murphy continued her strong freshman year. 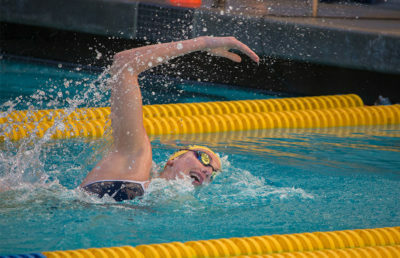 She was a member of the title-winning 200-yard freestyle relay and put personal bests in the 50-yard freestyle and 100-yard butterfly to secure major points for the Bears. She will be an effective replacement for Osman next year, especially once her 100-yard freestyle gets to the same level. With the Bears’ nine All-American swimmers, the program finished in the top-three for the ninth-consecutive year. But as inspiring as each athlete’s performances were, the Bears were unable to combine their diving, strength, depth and stars to overcome their glaring weaknesses and truly challenge Stanford. Christopher Zheng covers women’s swim. Contact him at [email protected].